Shkodran Mustafo opened the scoring when David De Gea failed to deal with his header before United got a lucky equaliser just minutes later when an offside Ander Herrera set-up Anthony Martial to make it 1-1. Alexandre Lacazette restored our lead midway through the second half as he poked home while tangling with two United defenders but some shocking defending from Sead Kolasinac gifted United an equaliser just seconds from the restart. Leno 6/10 | Palmed the free-kick away in the build up to the first United goal and was hesitant to close down Lingard for the second. Made a few other routine saves. Bellerin 6/10 | A fairly quiet game by his standards and when he did find some space his delivery was poor. Sokratis 7/10 | Another decent display from the Greek rock. Coped well after switching out to the left side of the back three when Holding got injured. Holding N/A | Was having another decent game before being stretchered off in the first half with what looked like a nasty leg injury. Fingers crossed it isn’t serious. Mustafi 7/10 | Opened the scoring with a lucky header and battled well against the United attack. Solid display overall. Kolasinac 6/10 | Was a threat down the left but his final ball was poor at times. Shocking defending to gift United a goal for 2-2. Guendouzi 7/10 | Struggled a little in the first half but much better after the break. Played some nice passes and even survived having his hair pulled by Fellaini! 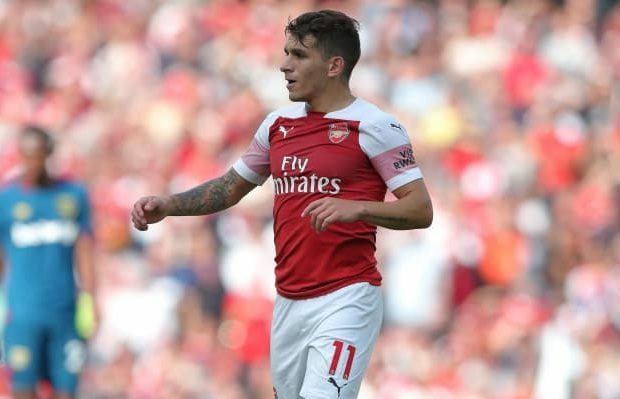 Torreira 8/10 | Another tenacious performance in the middle of the park from our South American midfielder. Made a number of tackles to disrupt United and covered every blade of grass. Ramsey 5.5/10 | Struggled to influence the game before being replaced at half time after picking up an ankle injury. Iwobi 6/10 | Plenty of willing and linked up well with Kolasinac a few times but wasn’t really much of a threat. Subbed. Aubameyang 6/10 | Missed a golden chance to make it 3-2 in the 72nd minute. Huge miss. Then forced De Gea in to a fine save from distance. Lichtsteiner 7/10 | On in the back three after replacing Holding and put-in a professional display. Mkhitaryan 6.5/10 | Missed a sitter from close range to make it 3-2 and had a goal ruled out for offside. Added some threat. Lacazette 7/10 | Somehow scored to make it 2-1 with a bizarre goal and had another ruled out when he headed the ball out of De Gea’s hand. Strictly speaking the goal should have stood but referee’s never allow this type of action these days.